Refuge of Delayed Souls is a complex, paranormal mystery which encompasses multiple timelines and intertwining stories. Volume Three ~Sidhe~ Grace Regan returns home unexpectedly, a young Stanley Birch meets a mysterious stranger and Elizabeth Whyte journeys through the standing stones. 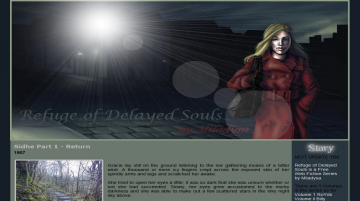 Refuge of Delayed Souls - Sidhe has not been reviewed yet. Refuge of Delayed Souls - Sidhe has not been recommended yet.